Paris Bordone (1495-1570) was a Venetian painter. 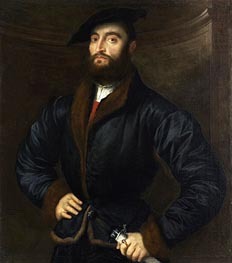 He was born at Treviso, and entered the bottega of Titian. Vasari, to whom we are indebted for nearly all the facts of Bordones life (later research has not added much to our knowledge) holds that he did not spend many years with Titian and set himself to imitate the manner of Giorgione to the utmost of his power. 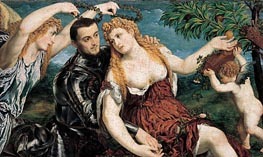 As a matter of fact, the Glorgionesque traits in Bordone's earlier works are derived entirely from Titian, whom he imitated so closely that to this day some of his paintings pass under Titian's name. 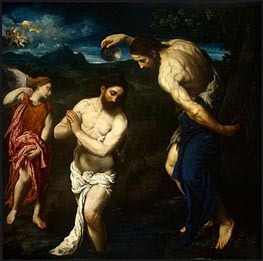 Crowe and Cavalcaselle and Dr Bode ascribe to Bordone the Baptism of Christ in the Capitoline Museums gallery, but Morelli sees in it an early work of Titian. Paris Bordone subsequently executed many important mural paintings in Venice, Treviso and Vicenza, all of which have perished. 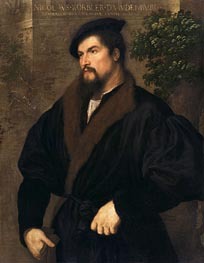 In 1538 he was invited to France by Francis I, at whose court he painted many portraits, though no trace of them is to be found in French collections, the two portraits at the Louvre being later acquisitions. On his return journey he undertook works of great importance for the Fugger palace at Augsburg, which again have been lost sight of. Bordone's pictures are of very unequal merit. They have a certain nobility of style, and that golden harmony of color which he derived from Titian, together with the realistic conception of the human Figure and the dignified character of his portraiture. On the other hand, his nudes are a little coarse in form, and the action of his figures is frequently unnatural and affected. 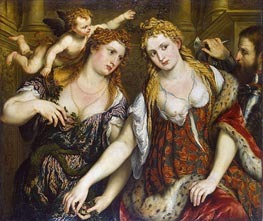 A true child of the Renaissance, he also painted a number of religious pictures, numerous mythological scenes, allegories, nymphs, cupids and subjects from Ovids fables, but he excelled as a portraitist. His principal surviving work is the Fisherman and Doge at the Venice Academy. 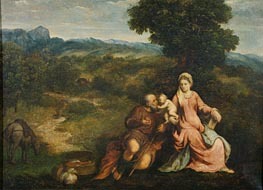 The National Gallery, London, has a Daphnis and Chloe and a portrait of a lady, whilst a Holy Family from his brush is at Bridgwater House. 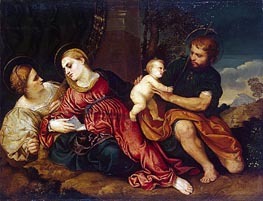 Other important works of his are the Madonna in the Tadini collection at Lovere, the paintings in the Duomo of Treviso, two mythological pictures at the Villa Borghese and the Doria palace in Rome, the Chess Players in Berlin, a very little-known portrait of superb quality in the possession of the landgrave of Hesse at Kronberg, and a Baptism of Christ in Philadelphia. Besides these, there are examples of his art in Bergamo, Milan, Genoa, Padua, Siena, Venice, Florence, Munich, Dresden and Vienna. Beyond some references in general works on Italian painting, very little has been written on Paris Bordone since the days of Vasari. In 1900 the committee of the fourth centenary of Paris Bordone, Treviso, published L. Barb and G. Biscaros Della Vita e delle Opere di Paris Bordone; and the Nuova Antologia (November, 16, 1900) contains a sixteen-page paper on Paris Bordone by P. G. Molmenti.